At Daystar Cleaning and Restoration, we are committed to offering our customers solutions for Stress-Free Healthy Living. Our comprehensive list of cleaning services is designed to make it as easy as possible for you to maintain a clean and healthy home without having to do all the work yourself! You can trust Daystar to clean your carpets effectively, ensuring your home is clean and healthy. We use a specialized, in-plant rug washing system to properly clean and dry your fine area rugs. Our tile cleaning process is efficient and effective, and is truly the only way to ensure clean, healthy floors. We will remove dust mites, dander, allergens, and other soils for cleaner and healthier living. We are certified carpet cleaners, and can treat and clean pet trouble areas to give you clean, fresh and healthy carpets. We'll clean, polish, and protect your natural stone floors to restore their natural beauty. 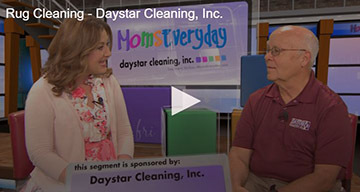 Let the insured and bonded staff at Daystar Cleaning and Restoration pamper you with stress-free healthy living! We will clean your windows inside and out to remove dirt and grime so you can see more clearly. We clean the exterior surfaces of your home using the safest and most effective methods available. Looking for more tips about keeping your home clean and healthy? Check out our videos on MomsEveryday.com!